The author of interesting characters like Huckleberry Finn and Tom Sawyer was an interesting man himself. Author and humorist Mark Twain was born Samuel Langhorne Clemens in Florida, Missouri in 1835. Clemens took the pen name Mark Twain, a nod to his early years as a riverboat captain on the Mississippi River. The term “mark twain” represents two fathoms (12 feet deep) and safe passage for riverboats. Twain, one of America’s first celebrities, is known for his biting wit and irascible personality—not to mention his iconic white suit and ever-present cigar. 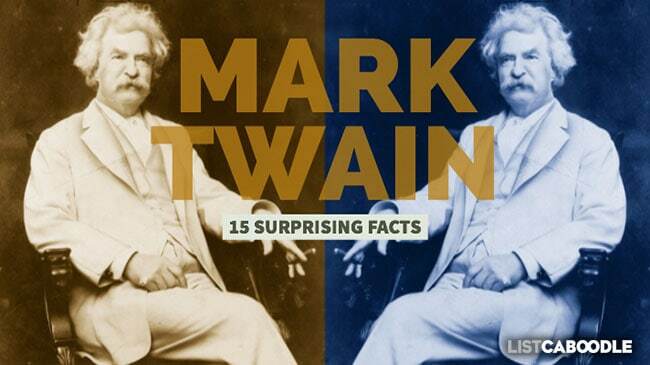 Discover a few of the many Mark Twain secrets and surprising facts here! Mark Twain and Louise Paine playing pool. Mark Twain famously boasted that he came in with Halley’s Comet and he would go out with it. The comet, named after British scientist Edmund Halley, appears in the sky every 75 years. It made an appearance in 1835, the year Twain was born, and again the year Twain died, April 21, 1910. Check out our short deep quotes page. In an 1853 letter to his mother, a young Samuel Clemens reports seeing a pair of caged, dwarf twins in New York City. They were most likely the “Wild Men of Borneo,” a sideshow act of P. T. Barnum. The “curiosity” left an indellible mark on him and he used twins (and twinning) as a literary theme throughout his life. For example, initial drafts of Pudd’nhead Wilson (preliminarily called Those Extraordinary Twins) included humorous predicaments involving differently-minded Siamese twins (one twin a drunkard and one a teetotaller, one pious and one not, etc.) and the inevitable tension and conflict between them. Twain had also seen the famous conjoined twins, Chang and Eng, and was fascinated by them. Mark Twain secrets: the written puzzle known as a rebus. When tired or frustrated Twain was known to have a strong and unforgiving temper. He found life-long adversaries in negative book reviewers and questionable business transactions. Even after his perceived enemies’ deaths, he held a grudge and spoke ill of them as if the wound was still fresh. His early years in Keokuk, Iowa had him dreaming of far-off places like the Amazon valley in Brazil and scheming new ways to make money. Twain read about a vegetable substance that, when ingested, gave the natives extraordinary strength and stamina to work all day without need for any other sustenance. He envisioned bringing cocaine to America and “spring that splendid enterprise upon an unsuspecting planet.” But potential partners never materialized. He lacked the financial ability to go it alone at his young age. The first half of the original manuscript of Huckleberry Finn was discovered in 1990 in an old trunk in an attic. It had been presumed to be lost forever. By 1865, Mark Twain found himself in San Francisco writing for newspapers and enjoying his fame. That year, as many as a dozen quakes shook the city. Twain was exillerated to the point of keeping an “Earthquake Almanac,” recording the dates of each geophysical event, commenting and taking notes. “This is the great earthquake month,” he wrote in November that year. Twain captured his dreams in notebooks throughout his life (even before Sigmund Freud made it popular). He used some of the notes to write an article titled “My Platonic Sweetheart” for Harper’s Monthly Magazine about his recurring dream-romance with a girl named Helen. He believed dreams were a different form of reality. “In our dreams—I know it!—we do make the journeys we seem to make; we do see the things we seem to see,” he implored in his essay. The Illinois senate race of 1858 pitted the incumbent Stephen Douglas against the challenger Abraham Lincoln, and is best known as the most famous political debates in American history. The Lincoln-Douglas debates focused mainly on the topic of slavery in the United States. It is unclear whether Twain felt strongly about the slavery issue or not, but he nonetheless recommended voters favor Douglas over Lincoln. “Will (Illinois) voters do their duty, and sustain Mr. DOUGLAS? We trust they will,” he wrote in the Missouri Republican. Douglass was re-elected to the senate. Twain’s brother Orion, on the other hand, would campaign fervently for Lincoln’s presidential bid two years later. As a reward for his hard work, Orion was granted a position in Carson City, Nevada as Secretary of the Territory. Always ready for a new adventure, Mark Twain packed up and joined his brother for his trip out west, bankrolling the trip with his riverboat pilot’s money. On a visit through Europe, Twain encountered many of the masterpieces he had read about back home. He was underwhelmed by Leonardo da Vinci’s The Last Supper. His criticisms mainly focused on the deteriorating condition of the paintings. “Wherever you find a Raphael, a Rubens, a Michael Angelo, a Caracci, or a Da Vinci (and we see them every day,) you find artists copying them, and the copies are always the handsomest. May be the originals were handsome when they were new, but they are not now,” he said. Twain was a fan of his local team, the Harford Dark Blues, in the early days of professional baseball in the early 1870s. Mark Twain’s Self-Pasting Scrapbook – Twain’s invention of a book with pre-gummed pages for scrapbooking. It sold quite well. Adjustable and Detachable Garment Strap – The suspender-like product was well-intended but had no sales. Kaolatype – A process for producing illustration engravings for printing (made obsolete by the invention of halftone photoengraving). History trivia game – A “memory improver” board game for teaching historical dates and facts. Paige typesetting machine – The machine was never fully functional and became Twain’s biggest money loser in his lifetime, causing him to file for bankruptcy. Fire extinguisher – A glass hand grenade filled with fire-extinguising fluid to be hurled into fires. Bed clamps – Clamps to hold bedsheets from slipping off children. Plasmon – A German health concoction derived from skim milk. Publishing – He published his own books as well as for others, including Ulysses S. Grant’s and Pope Leo XIII’s biographies. One of the more bizarre Mark Twain secrets concerns the Statue of Liberty. Workers had barely started building its foundation in New York Harbor when Twain came up with an alternative plan, certain to ruffle the feathers of the cultural elite. Instead of Lady Liberty, he thought the statue should honor Adam. “What have we done for Adam? Nothing. What has Adam done for us? Everything,” he said. He proceeded to sketch out his idea. Oddly, he also had thoughts of including Christopher Columbus’ remains in the base of the Statue of Liberty. If you enjoyed reading about surprising Mark Twain secrets and facts, you may also enjoy the hidden secrets of Leonardo da Vinci. History lovers will enjoy the 10 Ways Viking Warriors Changed the World.